Adult scoliosis is defined as a spinal deformity in a skeletally mature patient with a Cobb angle of more than 10° in the coronal plain. Adult scoliosis can be separated into four major groups: Type 1: Primary degenerative scoliosis, mostly on the basis of a disc and/or facet joint arthritis, affecting those structures asymmetrically with predominantly back pain symptoms, often accompanied either by signs of spinal stenosis (central as well as lateral stenosis) or without. These curves are often classified as “de novo” scoliosis. Type 2: Idiopathic adolescent scoliosis of the thoracic and/or lumbar spine which progresses in adult life and is usually combined with secondary degeneration and/or imbalance. Some patients had either no surgical treatment or a surgical correction and fusion in adolescence in either the thoracic or thoracolumbar spine. Those patients may develop secondary degeneration and progression of the adjacent curve; in this case those curves belong to the type 3a.Type 3: Secondary adult curves: (a) In the context of an oblique pelvis, for instance, due to a leg length discrepancy or hip pathology or as a secondary curve in idiopathic, neuromuscular and congenital scoliosis, or asymmetrical anomalies at the lumbosacral junction; (b) In the context of a metabolic bone disease (mostly osteoporosis) combined with asymmetric arthritic disease and/or vertebral fractures. Sometimes it is difficult to decide, what exactly the primary cause of the curve was, once it has significantly progressed. 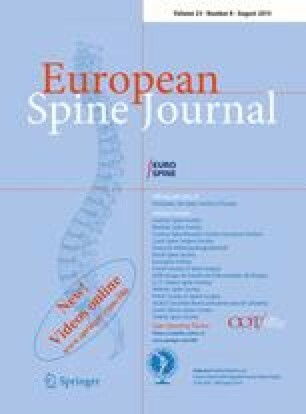 However, once an asymmetric load or degeneration occurs, the pathomorphology and pathomechanism in adult scoliosis predominantly located in the lumbar or thoracolumbar spine is quite predictable. Asymmetric degeneration leads to increased asymmetric load and therefore to a progression of the degeneration and deformity, as either scoliosis and/or kyphosis. The progression of a curve is further supported by osteoporosis, particularly in post-menopausal female patients. The destruction of facet joints, joint capsules, discs and ligaments may create mono- or multisegmental instability and finally spinal stenosis. These patients present themselves predominantly with back pain, then leg pain and claudication symptoms, rarely with neurological deficit, and almost never with questions related to cosmetics. The diagnostic evaluation includes static and dynamic imaging, myelo-CT, as well as invasive diagnostic procedures like discograms, facet blocks, epidural and root blocks and immobilization tests. These tests may correlate with the clinical and the pathomorphological findings and may also offer the least invasive and most rational treatment for the patient. The treatment is then tailored to the specific symptomatology of the patient. Surgical management consists of either decompression, correction, stabilization and fusion procedures or a combination of all of these. Surgical procedure is usually complex and has to deal with a whole array of specific problems like the age and the general medical condition of the patient, the length of the fusion, the condition of the adjacent segments, the condition of the lumbosacral junction, osteoporosis and possibly previous scoliosis surgery, and last but not least, usually with a long history of chronified back pain and muscle imbalance which may be very difficult to be influenced. Although this surgery is demanding, the morbidity cannot be considered significantly higher than in other established orthopaedic procedures, like hip replacement, in the same age group of patients. Overall, a satisfactory outcome can be expected in well-differentiated indications and properly tailored surgical procedures, although until today prospective, controlled studies with outcome measures and pre- and post-operative patient’s health status are lacking. As patients, who present themselves with significant clinical problems in the context of adult scoliosis, get older, minimal invasive procedures to address exactly the most relevant clinical problem may become more and more important, basically ignoring the overall deformity and degeneration of the spine.